U.S. Men's National Team attacker Christian Pulisic capped a breakout year last week by overwhelmingly being voted the 2016 U.S. Soccer Young Male Player of the Year. With no doubt as to his talent and upside, a hallmark of the now 18-year-old's success this year has been setting multiple records as the youngest player to achieve different milestones for both the U.S. MNT and with Borussia Dortmund in the German Bundesliga. Having made his Bundesliga debut in a 2-0 win against Ingolstadt (Jan. 30) and his first start in a 1-0 victory at Bayer Leverkusen (Feb. 21), Pulisic earned his first senior team call-up ahead of the MNT's all-important World Cup Qualifying clash against Guatemala on March 29 in Columbus. With the U.S. holding a comfortable 3-0 lead, Pulisic entered the match in replacement of Graham Zusi in the 81st minute, making him the youngest U.S. player to appear in a World Cup Qualifier at 17 years, 193 days in the eventual 4-0 win. Though he set a new mark for the U.S. in World Cup Qualifying, he was only the fifth youngest player to appear for the MNT all-time, following Freddy Adu (16 years, 234 days), Mike Slivinski (16 years, 318 days), Mark Jones (16 years, 332 days) and Bobby Convey (17 years, 151 days). Can't have all the records, right? Fresh off his MNT debut, Pulisic returned to Dortmund in April full of momentum. The attacker appeared in three of the team's next four matches, including a 1-1 draw with Liverpool in the UEFA Europa League on April 7. Ten days later, he opened his Dortmund account, scoring what would stand as the game-winning goal in the 38th minute of a 3-0 victory at Hamburg. With the goal, the young U.S. international became the youngest non-German player to score in the Bundesliga at 17 years, 211 days. One week after opening his Bundesliga account, Pulisic was on target again, scoring the second goal in Dortmund's 3-0 rout of Stuttgart. With the strike Pulisic also became the youngest player regardless of nationality to scored two goals in the Bundesliga at 17 years, 218 days. Pulisic's strong showings with Dortmund earned him a place on the USA's Copa America Centenario roster. As the team built up to the tournament with three warm-up matches, the winger's 69th minute goal in the MNT's final friendly against Bolivia made him the youngest player to score for the USA at the senior level at 17 years, 253 days, beating Juan Agudelo's previous mark of 17 years, 359 days. The goal came in just his third cap with the MNT. The MNT traveled to St. Vincent and the Grenadines at the beginning of September, knowing that a win in Kingstown would all but book the team's advancement to the Final Round of CONCACAF qualifying for the 2018 FIFA World Cup. Up 3-0 at halftime, the U.S. was in cruise control during the second half until Pulisic and returning MNT midfielder Sacha Kljestan entered in the 66th minute. It took just five minutes for the pair to link up, as Kljestan swung the ball to Pulisic in stride who buried inside the left post in the 71st minute, making him the youngest U.S. player to score in World Cup Qualifying at 17 years, 349 days. After assisting on Kljestan's strike seven minutes later, Pulisic would go on to set a second MNT record, with his well-placed stoppage time strike making him the youngest U.S. player to score two goals in a match. 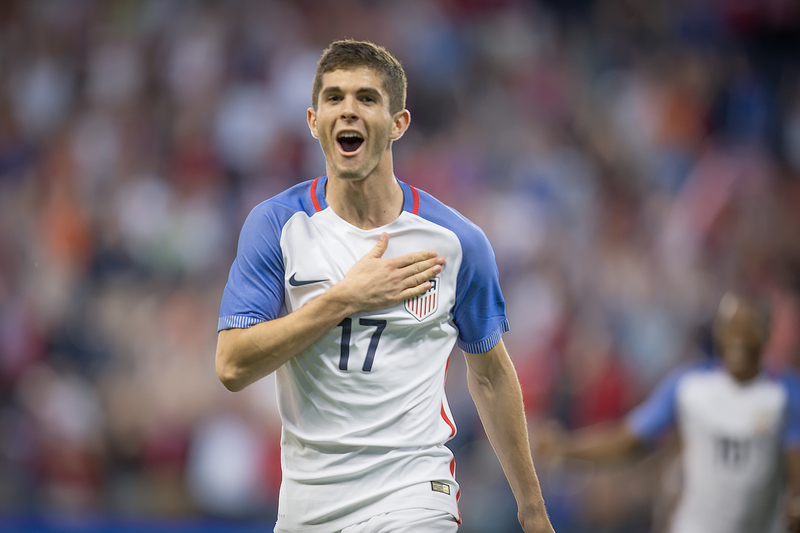 Four days after setting the two youngest player marks in St. Vincent, at 17 years, 353 days Pulisic also became the youngest U.S. MNT player to start a World Cup qualifier, beating Landon Donovan's previous mark of 18 years, 343 days by nearly a year. Pulisic put in a strong performance in the 4-0 win, assisting on Jozy Altidore's 62nd minute strike.His most memorable play of the day came 31 minutes earlier when his first-time shot ricocheted of both posts before being turned away. With all feats accomplished before his 18th birthday, Pulisic will have plenty more records to pursue now in adulthood.